Click here to register, today! The preconference workshop “Fundamentals of Team Science and the Science of Team Science: Enhancing Team-Based Research,” funded by the National Science Foundation (NSF), will be held on June 2, 2015 in Bethesda, MD. This workshop is being held one day prior to the 2015 Science of Team Science (SciTS) Conference. 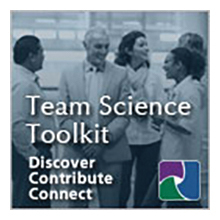 It is designed to serve as an primer in team science for those who are new to the field and want to enter the conference with a deeper understanding, or as a refresher in team science fundamentals for those with prior exposure. The workshop will provide participants with foundational knowledge of the SciTS field, including commonly used terminology and conceptual frameworks, a review of the state of the science and key emerging issues, and an introduction to tools and resources available to support, manage, and conduct effective collaborative research. This full day workshop is being organized and facilitated by Stephen M. Fiore, PhD, Associate Professor of Cognitive Sciences in the Department of Philosophy, University of Central Florida, Director of the Cognitive Sciences Laboratory at UCF's Institute for Simulation & Training, and President of the Interdisciplinary Network for Group Research. The workshop will include didactic, Q&A, and interactive break-out sessions with more than a dozen internationally recognized leaders in the SciTS field. This is an ideal opportunity for those interested in learning more about team science and to interacting with leaders in the SciTS field. All attendees will need to register, though there will be NO REGISTRATION FEE for the workshop. An overview of the agenda is below. Team Science 101: What is Team Science and What is the SciTS Field? What is the science of team science?